Ready to feed organic growing up milk Please follow preparation and feeding instructions carefully; failure to do so may make your baby ill 1. Check best before date and shake well before use 2. Remove plastic lid and gently squeeze bottle to check if foil seal is intact 3. Pour required amount of milk into a bottle or beaker 4. Feed at room temperature or warm if desired (check temperature before feeding) 5. For hygiene reasons, discard unfinished feed in bottle or beaker as soon as possible and always within 2 hours. Please discard any leftover milk. Important Feeding Information Do not heat feeds in a microwave, hot spots may occur which could cause scalding A responsible person should be with your baby during feeding Clean your baby's teeth regularly and introduce a cup or beaker as soon as possible to prevent prolonged/frequent contact of teeth with milk feeds which may increase the risk of tooth decay Unused milk left in this bottle can be resealed and stored in the fridge (at about 4-6°C) for up to 3 days Feeding Guide Toddlers from the 12th month onwards need about 360ml of HiPP Organic growing up milk per day, either as a drink, on cereals or added to other foods. This is only a guide and your toddler may need more or less than this. If you require more advice, please consult your health professional. HiPP Organic growing up milk is not suitable for vegetarians. Important Notice<br>Breastfeeding is best for babies. HiPP Organic growing up milk is intended for use from the 12th month onwards as part of a mixed diet and should not be used as a breastmilk substitute. 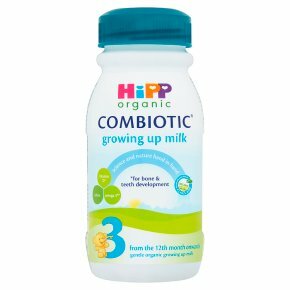 HiPP Organic growing up milk is recommended for use after any other follow on milk, and should only be introduced earlier if advised by a health professional, based on the infant's specific nutritional needs.